We are back in Dubai after a month of vacation in Germany. Still a little tired from the night flight, and our 80kgs of luggage evenly spread in the house (why is it so easy to create a mess?? ), we are happy to be back home. Despite 38C outside temperature and high humidity. We are trying to get our smells back into the house, which was abandoned for several weeks. A list has already been made of things that broke in the meantime and need maintenance, e.g. non-cooling air-conditioners, non-flushing toilets, etc. I never understood the logic, but in our house things break more often when not in use. I went to the shops to fill up the fridge, and probably spent the most time in the fruit and vegetable section. I announced to my family that I won't eat any bread and processed foods for next few weeks. After a month of heavy German food, I need veggies. It's not that I didn't like the foods but it's too heavy for my stomach. I don't want to blame the German food as such. In fact, I consider these sensitivities an age issue. Because it wasn't only the food that was hard to stomach, but also the alcohol, which I, admittedly, still like to enjoy when in good company. I made the mistake ( although I still do not regret it) to go out with my old friends from university, and we behaved and drank like we were still in our mid twenties. After an amusing evening with 5 Gin & Tonics I went home to have a 48 hour hangover, which is highly inappropriate when being with your family and attached duties. Things need to go back to normality, please. My kitchen counters and fridge are full with cauliflowers, broccoli, carrots, avocados, bean sprouts and olives. Detoxing is probably the right word to describe my body's needs. The cauliflower I bought is to make today's recipe to be my lunch tomorrow. Low-caloric foods with the fats coming from the right places whereby flavors are not being left behind. I never hated cauliflower, but I surely prefer it roasted as it summarizes everything you c an get out of cauliflower. I'd bet any time, to convert a cauliflower-hater when presented a roasted cauliflower with the right flavor combination. 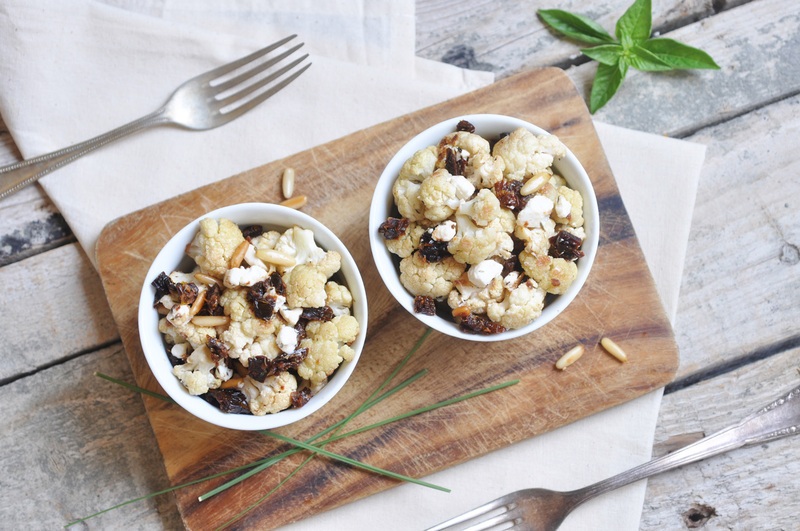 Pine nuts, sun-dried tomatoes and some crumbled feta cheese are all you need to do the trick. I bet you. Give it a try. Trim the cauliflower and cut into to bite-sized florets. Coat with the olive oil and season with salt and thyme. Spread out on a baking sheet or in a roasting dish and roast in the preheated oven for about 15-20 minutes, or until tender. In the meantime, rehydrate the sun-dried tomatoes in boiling water. Roast the pine nuts in a dry pan over medium heat until lightly browned, about 3-5 minutes. Transfer the roasted cauliflower to a serving dish. Drain the tomatoes and chop. Add tomatoes, pine nuts and crumbled feta and mix gently. Serve warm or at room temperature.